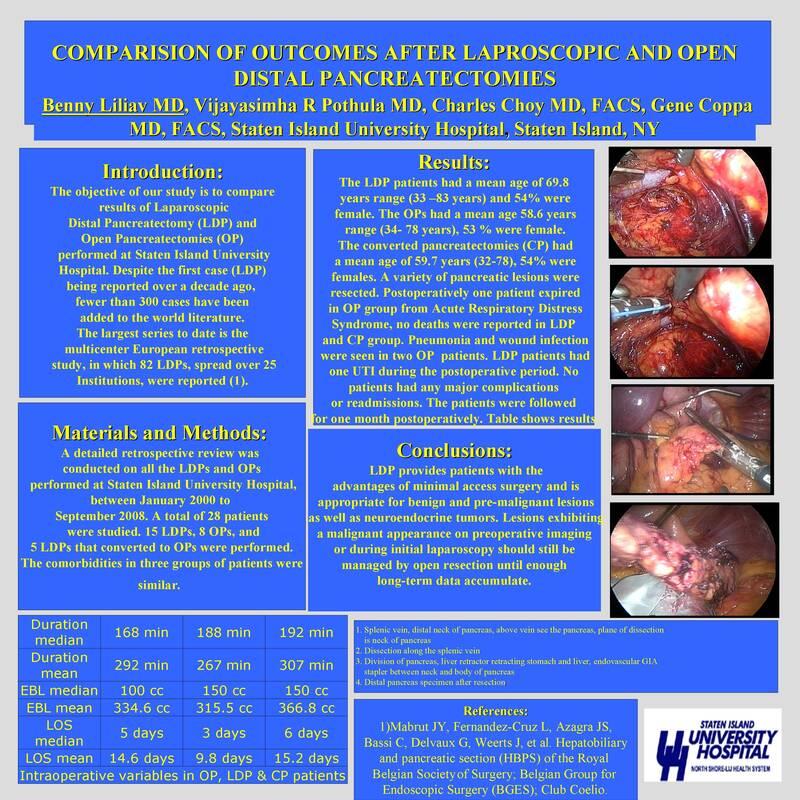 The objective of our study is to compare results of Laparoscopic Distal Pancreatectomy (LDP) and Open Pancreatectomies (OP) performed at Staten Island University Hospital. Despite the first case (LDP) being reported over a decade ago, fewer than 300 cases have been added to the world literature. The largest series to date is the multicenter European retrospective study, in which 82 LDPs, spread over 25 institutions, were reported (1). A detailed retrospective review was conducted on all the LDPs and OPs performed at Staten Island University Hospital, between January 2000 to September 2008. A total of 28 patients were studied. 15 LDPs, 8 OPs, and 5 LDPs that converted to OPs were performed. The comorbidities in three groups of patients were similar. Results: The LDP patients had a mean age of 69.8 years range (33 –83 years) and 54% were female. The OPs had a mean age 58.6 years range (34- 78 years), 53 % were female. The converted pancreatectomies (CP) had a mean age of 59.7 years (32-78), 54% were females. A variety of pancreatic lesions were resected. Postoperatively two patients expired in OP group, no deaths were reported in LDP and CP group. Pneumonia and wound infection were seen in two OP patients. LDP patients had one UTI during the postoperative period. No patients had any major complications or readmissions. The patients were followed for one month postoperatively. Table shows results. 1)Mabrut JY, Fernandez-Cruz L, Azagra JS, Bassi C, Delvaux G, Weerts J, et al. Hepatobiliary and pancreatic section (HBPS) of the Royal Belgian Society of Surgery; Belgian Group for Endoscopic Surgery (BGES); Club Coelio.